DESCRIPTION: Newly renovated in 2008 this lovely home offers unobstructed views of the ocean and the outer mountains from almost every room. 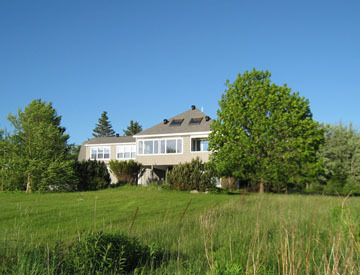 You will find this property to be very clean and private, the perfect place to spend you Maine Vacation! The house is just 150' from the water and when the tide is out, there's room for exploring on the beach. 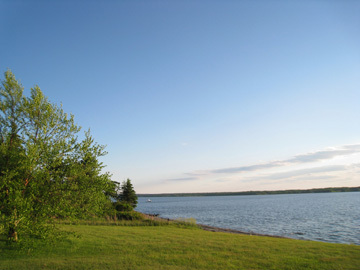 Approximately a 30 minute drive from Bar Harbor for a day of exploring in Acadia National Park and just 10 minutes from Ellsworth for other dining and shopping options. There is a stone patio for some outside seating as well. LAYOUT: GROUND LEVEL: Den with couch and tv. Bedroom with a queen bed, 3/4 bath (shower only). FIRST LEVEL: Living room with access to the small balcony, kitchen/dining room combo - kitchen offers an island with seating for 2 - 3 and the dining room has seating for 6 - 8. Laundry area w/ stack-able washer & dryer. Master bedroom with a king bed, tv and a private 3/4 bath (shower only). 3/4 bath (shower only). Small desk area. Bedroom with a queen bed. SECOND LEVEL: Bedroom/sitting area with a couch, tv, 2 twin beds and a 3/4 bath (shower only).